Hi All!!! I'm soo excited!! 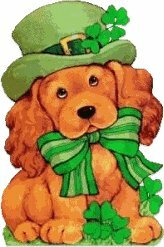 This is my first blog hop, so welcome to my stop on the St. Paddys' Day Blog Hop!!! This hop runs from March 17th at 11:30pm till March 19 at midnight!!! One Day Only!! This hop is hosted by Denise. If you get lost please head back there to start at the beginning or if you want to check out the entire lineup to make sure you didn't miss any stops!! You should have just come from Sigrid's beautiful blog and are now more than halfway through all the hop stops. Here is a close up of the face, I couldn't help myself, plus my rainbow made with the twinery twine!!! yay!! 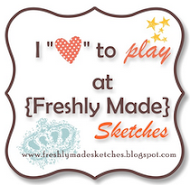 I love peachy keen stamps, they are soo cute and really make your project that much cuter!! love them!! Recipe: Recollections and Sizzix Cardstock and patterned paper, Eyelet outlet 3 leaf clover brad, micheals misc ribbon, Simply Charmed Cricut Cartridge, Sakura White Gel Pen, Yellow and Christmas red stickles, Black pigment ink, clear embossing powder, The Twinery bakers twine in caribbean, lemondrop, maraschino cherry, lilac, mandarin, and peapod, Hapmton art classic mini alphabet set, whisper stroked markers for outlining, pebbles inc hewel tone chalks for blush. So I was really happy with this card, I just love simply charmed, you're probably tired of seeing it, it's prob pretty dominant becuase it is soo cute!!! Please go and check out the other stops on the hop,. The next stop is Cheryl!! Check out her awesome project and beautiful blog!! Anyways, onto the cool part, well REALLY cool part!! I have BLOG CANDY!!!! yay!!!! How awesome!! ha ha ha...I'm really excited this is my first giveaway ever, and I will be sure to have tons more!! I am in a few more hops, so please keep checking back because they will all have giveaways!! Anyways, for this blog hop I am giving away a cuttlebug embossing folder (Congratulations) and a micheals "Peace.love.happiness" Stamp. To be eligible, please become a follower and leave a comment on this post!! thanks tons for stopping by!! Your card is so cute!! Glad I stopped by!!! I brought my BF with me- we are talking on the phone and hopping together!! _ so we dont get lost!! heheh- Im a new follower!! Oh, I love the way you used the twine! Thanks for sharing and for the chance to win. :o) I'm already a follower. This is so cute! I love how you made the rainbow out of twine. Adorable!! Love the leprechaun and his expression! TFS, now following! I very much like the creative use of twine, and also those Peachy Keen stamps. I'm a new follower ... come check out my blog, too! Sweet, thanks for sharing and nice to be in the hop together. super cute! Great idea to use the twine for the rainbow! new follower! So cute! His little face is awesome, so happy! This is super cute! I love the way you used the twine! Thank you for joining our “Let’s Go Green” challenge at Sentimental Sundays . Love this card. The eyes just pop off the page. And, the twine rainbow is fantastic! This is so totally fun, especially the twine rainbow, so neat! Thanks for playing along with Fab n Funky this week! This card is super cute.Love the leprechaun clickin' his heels and the twine is a great idea! I'd like to invite you to post your creations in our gallery at DesignersHerald.com to show off your wonderful style! Cute card. Love the face on that guy. Thanks for playing along with us at Cooking with Cricut. What a clever and adorable card! Love your use of twine. TFS and thanks for joining us this week at Cooking With Cricut. Such a cute card, Brenna! I love the twine rainbow, too. Very clever! Thanks for joining us this week at Cooking With Cricut.